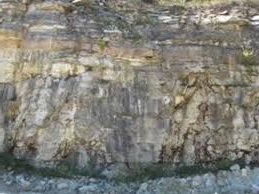 Unlike, Ohio’s Silurian dolostones, the dense limestones of the Bull Fork formation are virtually void of pockets. Most of the mineralization, at this locality, occurs when the hollowed out centers of fossils, such as Brachiopods, Eurypterids, Cephelopods and Trilobites, are geodized or completely filled with Calcite. These fossils vary in color from dark bluish gray to light tan. In many ways, the mineralization of these hollow fossils resembles typical Midwestern geodes. Typically, the best geodized centers are found in the larger Platestrophia Ponderosa, a brachiopod which occasionally grew to more than 3 inches. The average size for brachiopods found at Georgetown is 1 inch. The current theory is that after the animals decayed, those with complete and sealed skeletal shells allowed a hollow space to form in the rock. This hollowed-out center allowed a space for mineralization to occur. Those skeletal shells which were unsealed or incomplete were filled with sand and clay and became solid stone during the lithification process which formed this shale limestone. 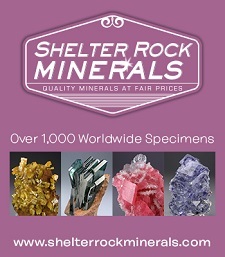 For this reason, in the best zones approximately 90 percent of the complete brachiopods are mineralized. Complete, larger and rounder Platestrophia Brachiopods have the greatest potential for geodized centers. Complete, but flattened, Platestrophia Brachiopods do not usually have a large enough space for crystal growth and are usually filled with Calcite and other minerals. Geodized brachiopods have been observed in most layers of the shaley Limestone. However, the best geodized fossils tend to form in the thinner soft shale layers and are often in clusters. 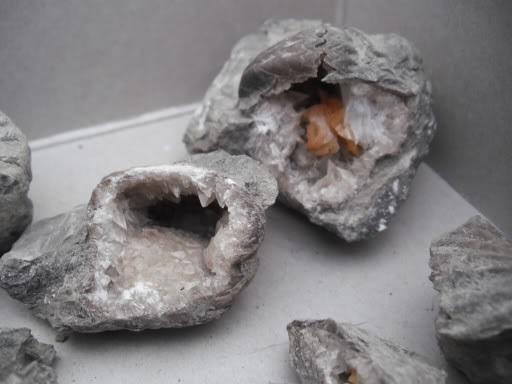 As opposed to most Midwestern geodes, which are typically lined with Quartz, the hollowed out centers of these fossils were first lined with small Calcite crystals. 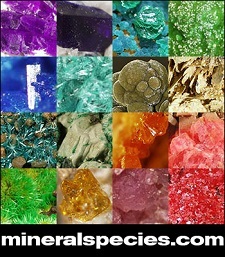 These Calcite geodized fossils were again mineralized, sometime later, with a surprisingly large assemblage including; Barite, 2nd Generation Calcite, Celestine, Dolomite, Ferroan Dolomite, Goethite, Marcasite, Pyrite, Quartz, Sphalerite and Strontianite. While geodized brachiopods are not nearly as common as quartz geodes found in many midwest localities, a larger percentage of the Calcite geodized brachiopods at this locality are hollow and have multiple minerals.